Usually, the title of a book or writing is given considering the main theme. From the title, one can easily understand what the author will dwell upon in the book or in the composition. The Novel, Pride and Prejudice was originally entitled First Impressions. But when Jane Austen revised her novel, she gave it a new title now it bears. This title is so appropriate that it requires hardly any arguments to justify. The very title, Pride and Prejudice indicates what the novel is written about. To show its significance we must go through the novel with a critical attitude and then we can explain why she has renamed her novel as Pride and Prejudice. It is not a novel of stormy passions and high tragedy of emotional life. Needless to add, Jane Austen has never claimed that she is a psychological novelist. Her primary concern is to represent the comedy of domestic life and the personal relation that exists between man and man, man and woman, husband and wife and at least between the classes of the society. In this connection, she has delineated the characters in their interactions when they move and live in the society. 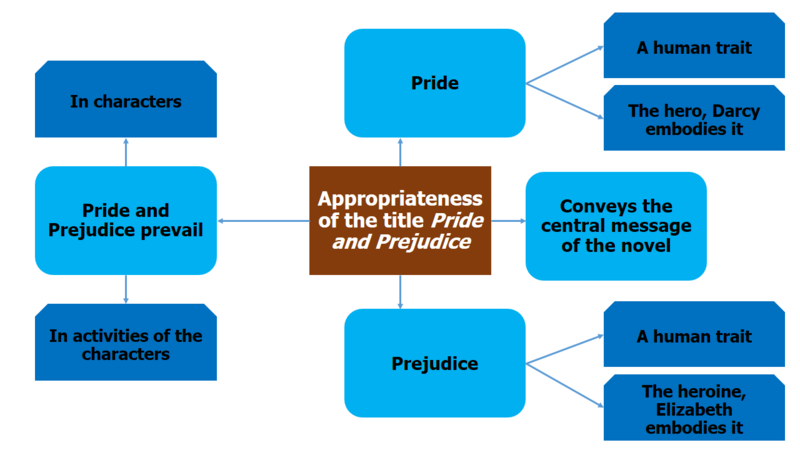 The words ‘Pride’ and ‘Prejudice’ are very significant in the characterization of the novel. The hero and heroine of the novel embody these traits of human character. When Mr. Darcy was first introduced in the novel, he was declared to be, “The proudest, most disagreeable man in the world.” All his actions may be traced to pride. Wickham explains this pride to Elizabeth Bennet as ‘filial pride’. As he belongs to the upper middle class of the society, he bears this pride of being superior to others. This cult of pride he inherited from his father is now dead. This pride is also in the character of his sister, Georgiana, and Wickham calls it “brotherly pride.” He ironically tells that pride has often been his best friend. Darcy admits it and says that his pride consists in his being ‘selfish’ and ‘overbearing’. He makes a confession to Elizabeth when he contemplates over his past actions that his father had a role in making him proud. In spite of being taught good principle, he was allowed and even encouraged by his father to be ‘selfish’ and ‘overbearing’ to think meanly of all the rest of the world and at least to wish to think meanly of their sense and worth when compared to his own going to propose to Elizabeth, he was not forgetful of his pride. He spoke of tenderness and pride with equal balance. Even his pride makes him blind to the faults of the members of his own class. Darcy is not only proud but also prejudiced against all who are not at par with him in richness and social position. His social superiority, refinement, and wealth lead to this general prejudice. That is why, he is as Elizabeth has made it clear later on, prejudiced against Wickham, Jane and in general against anything that does not fit into his social world. On the other hand, Elizabeth has her pride. Her pride consists of being perceptive and refined. At the same time, she is prejudiced against Darcy. But her prejudice does not stem from any moral purpose but from her hurt-pride. It was her personal pride when Charlotte says that Darcy has a right to be proud, Elizabeth does not protest but says, “I could easily forgive his pride if he had not mortified mine.” So, she is both proud and prejudiced. But in course of time, they sacrifice their Pride and Prejudice as they become convinced of the hollowness of these vain sentiments. The vulgarity of Darcy’s aunt shocked him and taught him that refinement is not the monopoly of the elite. This new vision of him led him to play a vital role in the Lydia-Wickham episode. Besides, Elizabeth’s refusal to marry him opened his eyes that social superiority was not everything in life. Thus there is a new-awakening in his heart and he shacks off his pride and prejudice completely. Elizabeth too gets a new understanding. The letter of Darcy helps her give up her pride and prejudice. Now she is ashamed to think how she has been ‘blind, partial, prejudiced and absurd’. This new awakening of herself prompted her to reassess Darcy and recognized his talent and good disposition. She even considered that Darcy would most suit her. So long, pride and prejudice blinded them and now these verities have disappeared. Time is now ripe for them to get married. Pride and prejudice were not in the characters of the hero and the heroine only. Gilbert Ryle says, “Every character of the novel exhibits too much or too little pride of a bad or silly sort or pride of a good sort, sham pride or genuine pride and so forth.” Mr. Bennet has genuine pride. He hates the despicable. But his pride is inverted and unexecuted. He voices his just contempt in witty words but he does nothing to prevent or repair what he condemns. Mr. Bingley has no special pride but his sisters are proud in the sense of being vain. In this way, almost all the characters have more or less of pride and prejudice. To sum up, there would have been no appropriate name except Pride and Prejudice for this novel. Therefore, the title is quite appropriate and bears significance so far as the exposition of the theme is concerned. Now, let’s have a look at the summary of the article below. If you find this article helpful, please let us know in the comment below. please send me the answer of “comment on the plot construction of pride and prejudice by jane austen”.Mention point wise.